Microtech Small Arms Research has their firearm website back online. This has been long rumored since their bankruptcy. 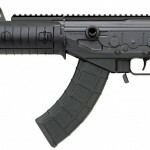 It appears the new STG-E4 will be offered in 5.56mm and .300BLK but no mention of the former 7.62x39mm, 5.45x39mm, or 6.8SPC Remington offerings. 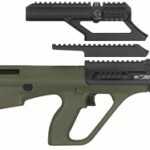 An internet rumor (via Bullpup Forum) claims it may be offered with the HTM 2020 trigger pack sold by Rat Worx. Both parts are good news and we are hopeful MSAR will come back with a strong product. 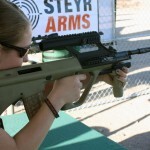 Update (2012 July 23): The Firearm Blog kindly linked back to us on this story. Their (his) policy of “Firearms not Politics” is what has kept me as a frequent reader; without question it is the best gun related blog online. I posted details on the new AUG variant on The .. I sent back a malfunctioning STG556 rifle and when I got it back I found that they had replaced numerous parts at no charge..I have shot around 300-350 rounds of mixed ammo threw it and have had zero malfunctions.They seem to be determined to rectify past issues and back their product. I guess they hired some good people. I wish them the best.and can recommend their rifles. Mine run’s perfect.